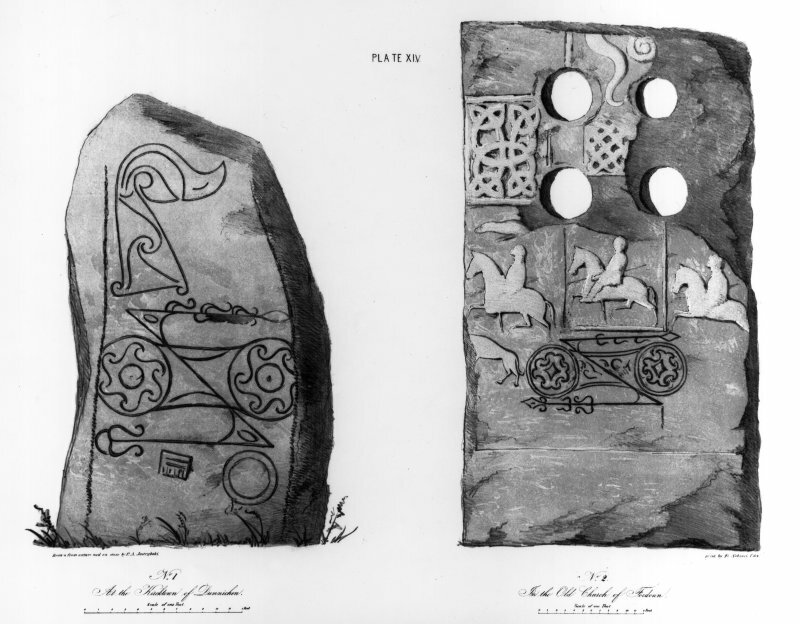 The Dunnichen symbol stone and Fordoun cross-slab. From P Chalmers, 1848, The Ancient Sculptured Monuments of the County of Angus, plate xiv. 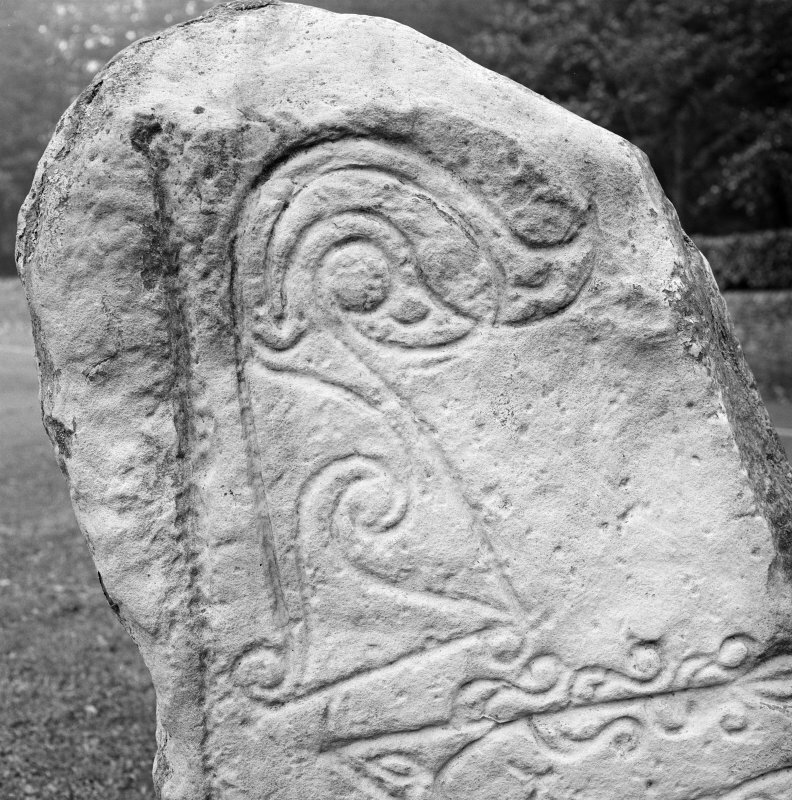 Front detail of Dunnichen Pictish symbol stone. 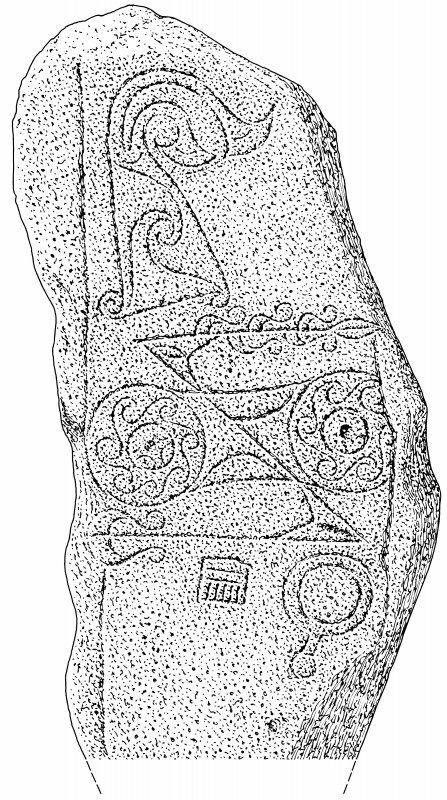 Viwe of face of cast of Dunnichen Pictish symbol stone. 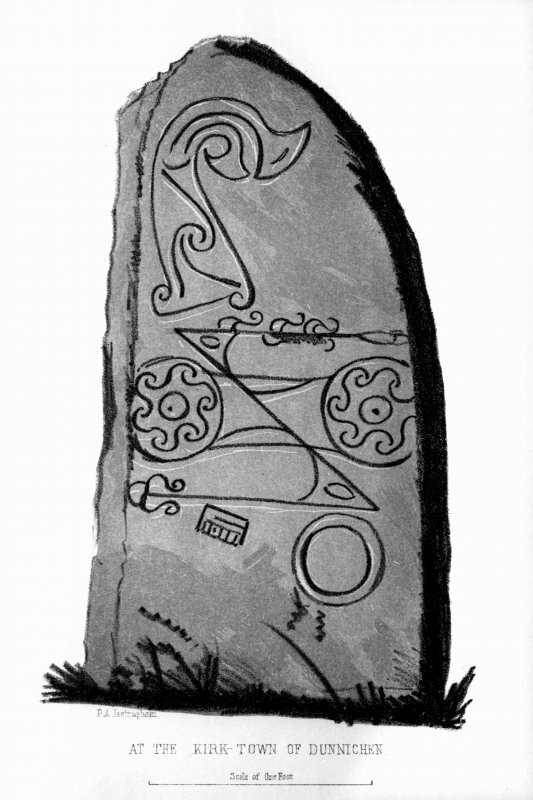 Dunnichen symbol stone, from J Stuart, The Sculptured Stones of Scotland, i, pl. 92. Evidence for discovery: said to have been found during ploughing in 1811 on the Dunnichen estate, it was erected first at the Kirkton at Dunnichen and then in the late nineteenth century in the garden of Dunnichen House. Around 1967 it was taken to the museum at St Vigeans and in 1972 transferred to Dundee Museum and Art Gallery. A replica stands on the village green at Dunnichen. A large undressed slab incised on one face with the flower symbol, an ornate double disc and Z-rod symbol, and a mirror and single-sided comb. The double discs contain running spirals. Primary references: Chalmers 1848, pl 14; ECMS pt 3, 206-7; RCAHMS 2003. Present location: The Meffan Institute, Forfar. Evidence for discovery: said to have been found during ploughing in 1811 on the Dunnichen estate, it was erected first at the Kirkton at Dunnichen and then in the late nineteenth century in the garden of Dunnichen House. Around 1967 it was taken to the museum at St Vigeans and in 1972 transferred to the museum in Dundee and subsequently to Forfar. A replica stands on the village green at Dunnichen. A Class I symbol stone: a rough sandstone pillar, 4'8" high, 2'3" wide and 1' thick, sculptured on one face with incised symbols which include the 'flower', double-disc, Z-rod, 'mirror', and 'comb'. On each face of the stone there are grooves and holes which do not seem to have formed part of the original design. The stone was ploughed up in 1811 in a field named 'Chashel' or 'Castle' Park on the terrace N of the site of 'Nechtansmere' and on the farm of East Mains of Dunnichen at a spot now occupied by a quarry. Immediately below the stone, a "stone coffin" containing bones was found (Jervise 1858). 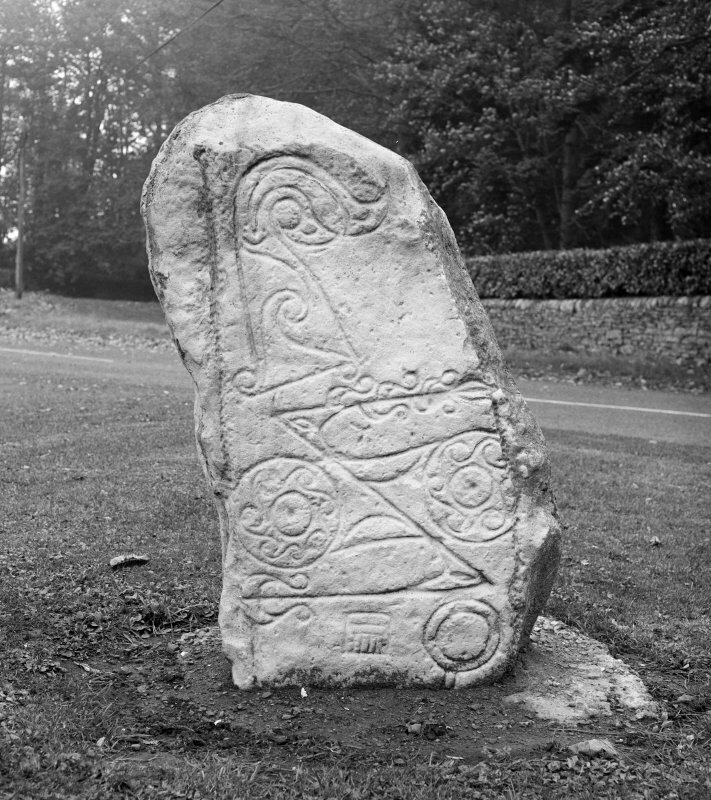 The symbol stone was removed first to a site at Kirkton, near the church, then to its present position in the garden of Dunnichen House. J R Allen and J Anderson 1903; A Jervise 1859; New Statistical Account (NSA) 1845; A J Warden 1880-5. This stone, as described, still stands in the garden of Dunnichen House. Enquiries at East Mains of Dunnichen failed to locate the field 'Chashel' or 'Castle' Park, but there is an old quarry on the OS 25" map at NO 5165 4960. Enquiries also failed to locate the name 'Kirkton', but the Rev J M Black, Dunnichen Manse, suggests that it may have been 'Kirkden' church (NO 5316 4850). Visited by OS (WDJ) 11 May 1966. This symbol stone was removed c.January 1967 to the museum at St Vigeans, Arbroath. Visited by OS field Surveyor 6 November 1967. Information contained in letter from L Thoms, Dundee Museum 2 June 1980. Class I symbol stone showing a vertical arrangement of a flower above a double-disc and Z-rod and mirror-and-comb.